Mensi, I., Daugrois, J. and Rott, P. (2017). Bioassay of Xanthomonas albilineans Attachment on Sugarcane Leaves. Bio-protocol 7(2): e2111. DOI: 10.21769/BioProtoc.2111. Sugarcane (interspecific hybrids of Saccharum species) is an economically important crop that provides 70% of raw table sugar production worldwide and contributes, in some countries, to bioethanol and electricity production. Leaf scald, caused by the bacterial plant pathogen Xanthomonas albilineans, is one of the major diseases of sugarcane. Dissemination of X. albilineans is mainly ensured by contaminated harvesting tools and infected stalk cuttings. However, some strains of this pathogen are transmitted by aerial means and are able to survive as epiphytes on the sugarcane phyllosphere before entering the leaves and causing disease. Here we present a protocol to estimate the capacity of attachment of X. albilineans to sugarcane leaves. Tissue-cultured sugarcane plantlets were immersed in a bacterial suspension of X. albilineans and leaf attachment of X. albilineans was determined by two methods: leaf imprinting (semi-quantitative method) and leaf washing/homogenization (quantitative method). These methods are important tools for evaluating pathogenicity of strains/mutants of the sugarcane leaf scald pathogen. The mechanisms that govern the interactions between X. albilineans and its host plant (the sugarcane) are not well known. Albicidin, a phytotoxin produced by albilineans, is the only molecular factor which has been demonstrated to play a role in pathogenicity of this pathogen (Birch, 2001). However, pathogenicity of X. albilineans doesn’t completely depend on albicidin. Albicidin-deficient mutants are still able to colonize efficiently the sugarcane stalk and to produce disease symptoms (Birch, 2001; Rott et al., 2011). Studies using full grown sugarcane are space and time consuming. Bioassays using miniaturized plants (tissue-cultured plants) or detached leaf bioassays can be very useful because they are less space consuming and they allow the study of plant-pathogen interactions in controlled environments. In vitro propagation of plants is widely used to rapidly propagate disease-free planting material under controlled conditions (Kumar and Reddy, 2011). Additionally, leaf imprinting has been widely used to study the ecology of bacteria associated with the phyllosphere (Hirano and Upper, 2000; Yadav et al., 2010). However, to our knowledge, these techniques have never been associated to decipher pathogenicity of bacterial plant pathogens. To identify additional pathogenicity factors of X. albilineans, especially factors involved in the early phases of infection (epiphytic phase), we developed a new miniaturized bioassay using tissue cultured sugarcane plantlets. Attachment of X. albilineans to sugarcane leaves under axenic condition was reproduced (Fleites et al., 2013; Mensi et al., 2016). This bioassay will permit the rapid testing of leaf attachment capacity of wild type and mutant strains of the pathogen causing leaf scald disease, but also of other bacteria colonizing the sugarcane leaf canopy. Tissue cultured plantlets of sugarcane cultivar CP68-1026 originating from apex tissue are propagated and maintained in a growth chamber at 28 °C with 12 h light. Using 200 mm long tweezers, remove the tissue cultured-plantlet from the tube and place it on a glass plate under a sterile hood, separate young secondary tillers from the primary tiller with a scalpel and sterile blades. Using 200 mm long tweezers, place each secondary tiller in a new 200 x 20 mm test tube containing the nutritive medium for sugarcane plantlets. Secondary tillers may vary in size but only tillers that were 150-200 mm long were transferred for future inoculation. All transferred plantlets must have two to four unfolded leaves. Incubate the test tubes in a growth chamber at 28 °C with 12 h of light for four weeks. Five days before plant inoculation, streak out each strain of X. albilineans to be tested from -80 °C distilled water stocks using a sterilized blade or a pipet tip onto WM agar plates with appropriate antibiotics (for mutant strains) and let the cultures grow for 5 days in an incubator at 28 °C. For each strain, suspend bacterial colonies from the agar plate with a sterile polypropylene loop in 10 ml of sterile distilled water in a 15 ml Falcon conical centrifuge tubes (to obtain a turbid suspension). Vortex the bacterial suspension manually or gently with a benchtop vortex and then measure its optical density at 600 nm (OD600) using a spectrophotometer. To prepare the stock suspension, adjust the bacterial suspension with sterile distilled water to obtain an OD600 = 0.25-0.30 which corresponds to 109 Colony Forming Units (CFU)/ml. To prepare the inoculum at 107 CFU/ml, dilute 5 ml of the bacterial suspension calibrated at 109 CFU/ml in 495 ml of sterile distilled water in a 500 ml Erlenmeyer flask. For inoculation, use plantlets with two to four fully unfolded leaves (Figure 1). Use sterile tweezers to immerse the leaves of the tissue-cultured plantlets into the bacterial suspension adjusted at 107 CFU/ml for 30-40 sec (Figure 2). During immersion of leaves, make gentle circular movements of the Erlenmeyer flask in order to optimize the contact of the bacterial suspension with the sugarcane leaf surfaces. After immersion, remove excess of bacterial suspension by dragging the leaves across the edge of the wall of the Erlenmeyer flask: no visible droplet should be seen on the leaf surfaces. Then, replace the inoculated plantlets in the same test tubes containing the same nutritive medium (using sterile tweezers). Keep inoculated plantlets in a growth chamber at 28 °C with 12 h of light for 14 days. Inoculate at least six (for leaf imprinting assay, cf. D.1) to 15 (for leaf washing and tissue homogenization assay, cf. D.2) sugarcane plantlets per strain of X. albilineans and distribute them randomly in the growth chamber. Inoculate control plantlets with only sterile distilled water. Leaf attachment of X. albilineans can be determined using two methods: 1. imprints of sugarcane leaves on selective medium (semi-quantitative method) and 2. leaf washing and tissue homogenization (quantitative method). Fourteen days after immersion, remove the inoculated sugarcane plantlets (one by one) from the test tubes and put them on a sterile soft tissue (Figure 3). Use a scalpel with a sterile blade to remove leaves (remove and imprint only non-withered leaves). Figure 3. 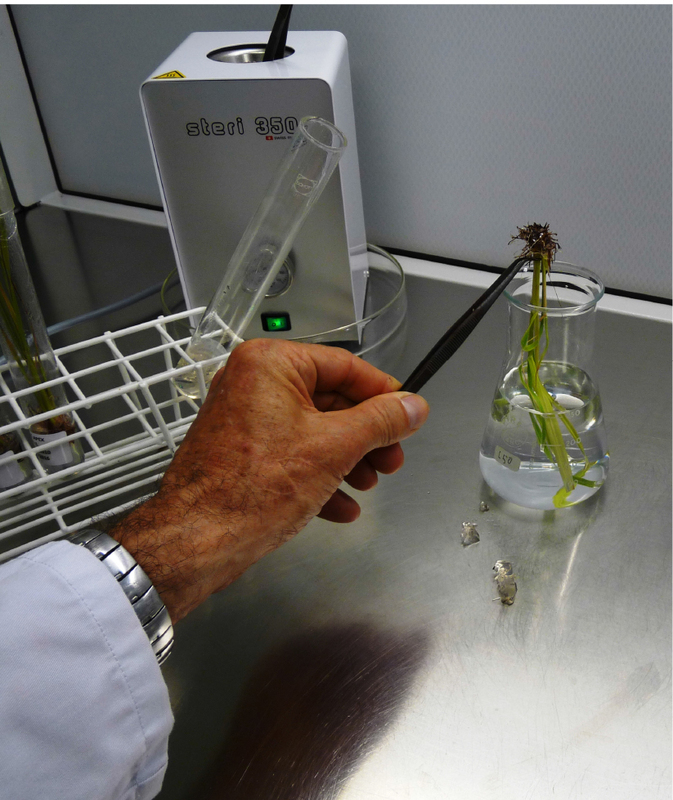 Removal of the sugarcane plantlet from the test tube in an aseptic work area (laminar flow cabinet). A. Remove the inoculated sugarcane plantlet from the test tube using long sterile tweezers, 14 days after immersion and B. put it on a sterile soft tissue. Using disposable sterile tweezers, gently place detached leaves on WSD medium in 90 x 15 mm plates and apply a soft pressure with the tweezers to imprint the lower and then the upper leaf surface on the agar medium (Figure 4). Leaves for imprinting may vary in length but must have a green color. If the length of the leaf exceeds the plate diameter, cut the leaf into two or three fragments before performing the imprint. The quality of the imprinted leaf area can be observed by trans-illumination using day or artificial light. Place agar plates in an incubator at 28 °C for 5 days. Five days after incubation, examine plates for presence or absence of X. albilineans colonies in the imprint area. 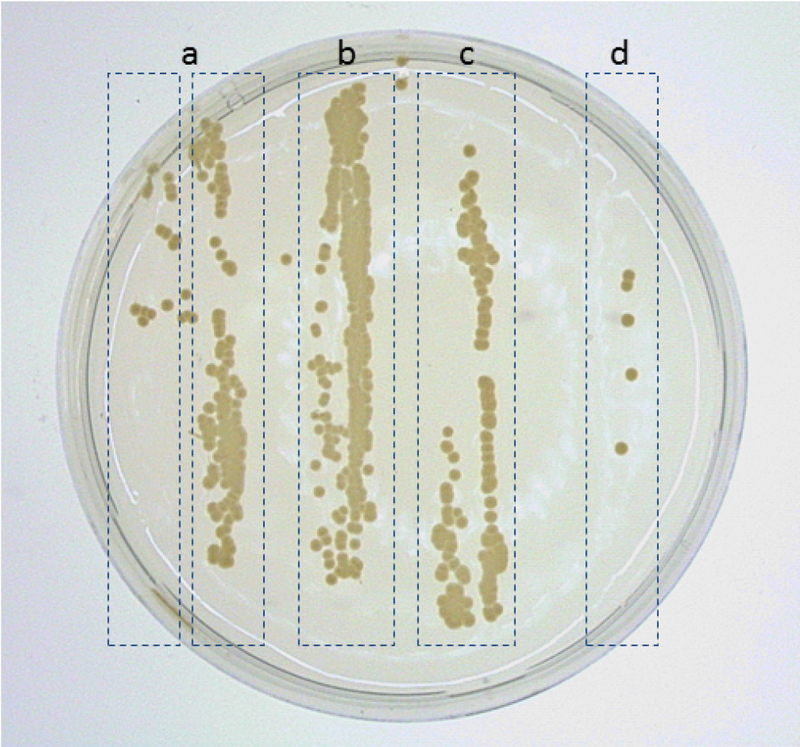 Density of X. albilineans colonies growing in the imprint area can vary between absences of colonies to confluent growth of bacteria in the imprint area (Figure 5). Figure 5. 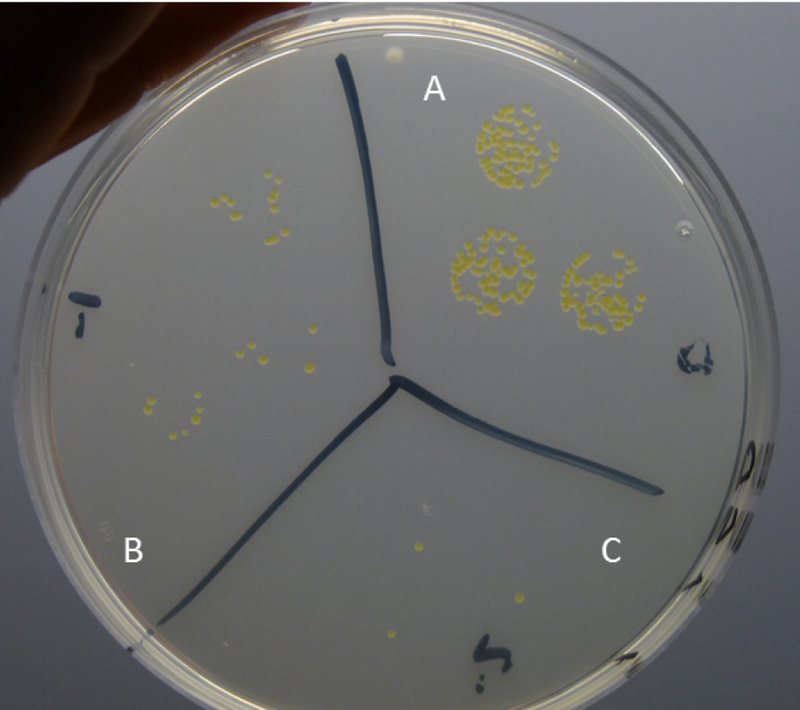 Growth of colonies of X. albilineans in imprints of sugarcane leaves on WSD medium, 14 days after immersion of leaves in a bacterial suspension adjusted at 107 CFU/ml. a. Imprint of the upper surface of leaf n1; b. Imprint of the lower surface of leaf n1; c. Imprint of the upper surface of leaf n2; d. Imprint of the lower surface of leaf n2. Leaf n1 is the first leaf from the top of the sugarcane plantlet that is completely unfolded. Leaf n2 is the leaf immediately below leaf n1 (Reprinted from Fleites et al., 2013). 6 = confluent growth of bacteria in 81% to 100% of the imprint. Figure 6. Score used to estimate Extent of Leaf Attachment (ELA). 0 = 0 to 5 five colonies in the leaf imprint, 1 = 6 to 50 colonies in the leaf imprint, 2 = more than 50 colonies and no confluent growth, 3 = confluent growth of bacteria in less than 10% of the leaf imprint, 4 = confluent growth of bacteria in 10% to 40% of the leaf imprint, 5 = confluent growth of bacteria in 41% to 80% of the leaf imprint, 6 = confluent growth of bacteria in 81% to 100% of the leaf imprint (Reprinted from Mensi et al., 2016). NT is the total number of leaf imprints per plantlet. Calculate average ELA for each bacterial strain or mutant tested using all ELA values obtained for the six inoculated plantlets. Determination of X. albilineans leaf attachment by leaf washing and tissue homogenization. For this bioassay, 15 sugarcane plantlets were inoculated per strain. At each sampling time (1 h, 7 and 14 days), five plantlets and two leaves per plantlet were individually used to determine attachment capacity of X. albilineans. The experiment is repeated independently at least two times. Leaf washing is performed to detach and quantify bacteria that are located on the leaf surface, whereas leaf homogenization is performed to isolate and quantify bacteria from protected areas (such as stomatal chambers) or from inside the leaf. 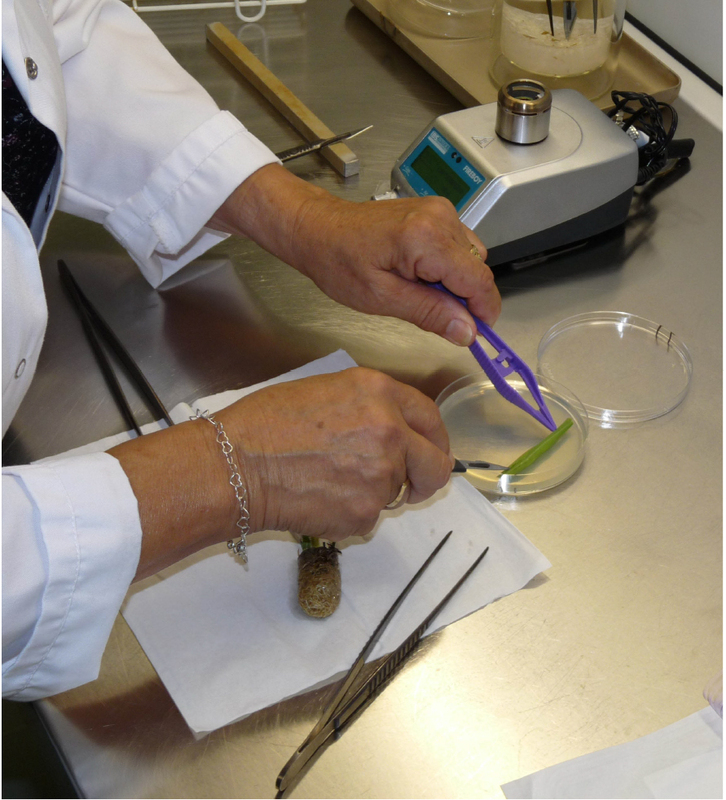 At 1 h, 7 and 14 days after immersion of sugarcane leaves in the bacterial suspension, use sterile tweezers to remove plantlets from the test tubes, put them on sterile soft tissue (Figure 3) and cut two leaves from each plantlet (using a scalpel with a sterile blade). Collect only inoculated and non-withered leaves. Cut a 7 cm long fragment from each leaf (Figure 7A) and immerse each fragment individually in a 1.5 ml micro-centrifuge tube containing 1 ml of sterile distilled water with 0.005% Tween 20 (Figure 7B). Note that each leaf fragment is analyzed separately. Figure 7. Steps describing leaf washing and tissue homogenization. A. Cut a 7 cm long fragment from two leaves of each inoculated plantlet. B. For leaf washing, immerse each leaf fragment individually in a 1.5 ml micro-centrifuge tube containing 1 ml of sterile distilled water and 0.005% Tween 20. C. For tissue homogenization, use a pestle made for micro-centrifuge tubes and homogenize the leaf fragment in the same tube, each tube containing 820 μl of wash water after removal of 180 μl for bacterial counts. D. Homogenized leaf tissue. Vortex the tubes vigorously for 10 sec to wash leaf fragments. Use 100 μl of each wash water to make 10 and 100 fold dilutions. Gently drop three or four times 20 μl of each undiluted, 10 and 100-fold diluted wash water on WSD plates. Place the agar plates in an incubator at 28 °C for 6 days (Figure 8). Using a pestle made for 1.5 ml micro-centrifuge tubes, homogenize each leaf fragment in the remaining wash water (820 μl after removal of 180 μl in A. for determination of bacterial populations) for 5 min (Figures 7C and 7D). Use 100 μl of each homogenized tissue suspension to make 10 and 100 fold dilutions. Gently drop three or four times 20-μl of undiluted, 10 and 100 times diluted homogenized tissue on WSD plates. Place the agar plates in the incubator at 28 °C for 6 days. Count colonies for each dilution and each of the three-four replications after 6 days of growth; calculate the average number of colonies and correct for dilutions. 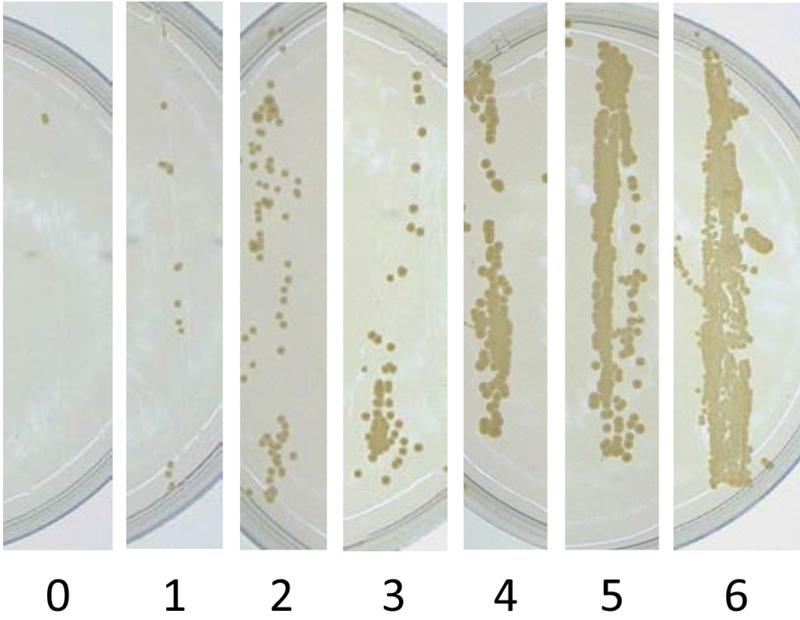 For example, 15 colonies on the 10-1 dilution plate correspond to 7,500 CFU present in the leaf section. Convert to log10 CFU per leaf section for the wash water or homogenized tissue. For wash water and for homogenized tissue, calculate average log10 CFU for each bacterial strain or mutant tested using all values obtained for the six inoculated plantlets. Data were analyzed using the statistical software package R, version 2.14.1 (R Development Core Team) as described by Mensi et al. (2016). Extent of Leaf Attachment (ELA) values are the combination of means of three independent experiments with six replicates (plantlets) per strain or mutant in each experiment. Note that two to four leaves were imprinted per plantlet. Although there can be significant variability between means of ELA between plantlets, all data are used for statistical analysis. For the determination of leaf attachment by leaf washing and leaf homogenization, data are from 20 leaves and combined from two separate experiments of five plantlets each (two leaves sampled per inoculated sugarcane plantlet and five plantlets used at each sampling time). Individual population data (CFU/ml) are transformed using the log10 function (y = log10 [(CFU/ml) + 1]) before calculation of population means. When appropriate (few nil data), individual log transformed data can be used for mean comparison by variance analysis. Data obtained by leaf imprinting (semi-quantitative method) and leaf washing (quantitative method) are correlated and yield similar information as they are both linked to bacterial populations present on the leaf surface. In contrast, data obtained by leaf homogenization are linked to bacteria that cannot be easily detached from the leaf surface and that are located in protected leaf areas or inside the leaf. Leaf imprinting is recommended for rapid and easy screening of bacterial strains for leaf attachment capacity. Leaf washing/homogenization is recommended to obtain more precise and quantitative data, and additional information regarding location of bacteria on or in the leaf. Bacterial suspension preparation, plantlet sugarcane immersion, and foliar imprints are performed under a laminar flow cabinet (sterile conditions). The bacterial suspension used to inoculate sugarcane plantlets is prepared freshly (just before the inoculation procedure). The bacterial suspension is prepared with only a few single colonies to obtain the desired bacterial concentration. The number of colonies used will depend on the size of the colonies. The bacterial strains stored in the freezer at minus 80 °C are each issued from a single colony. Choose carefully the sugarcane leaves for imprinting or washing; we choose only green and non-withered leaves. The area of confluent growth was estimated visually using a template with 10% leaf area increments. Sugarcane cultivar CP68-2016 was used herein, but other cultivars susceptible to sugarcane leaf scald can also be tested. Non-specific adhering was not observed with the bacterial strains used herein. However, it can be a good idea to identify and include a bacterial species not adapted to sugarcane as a negative control. We thank Marie-Josée Darroussat for excellent technical assistance. Imène Mensi was supported by a PhD fellowship from Cirad. The work is supported by the USDA National Institute of Food and Agriculture [project Hatch/Rott FLA-BGL-005404]. This protocol was adapted from work published by Fleites et al. (2013) and Mensi et al. (2016). Birch, R. G. (2001). Xanthomonas albilineans and the antipathogenesis approach to disease control. Mol Plant Pathol 2(1): 1-11. Chatenet, M., Delage, C., Ripolles, M., Irey, M., Lockhart, B. E. L. and Rott, P. (2001). Detection of Sugarcane yellow leaf virus in quarantine and production of virus-free sugarcane by apical meristem culture. Plant Dis 85(11): 1177-1180. Fleites, L. A., Mensi, I., Gargani, D., Zhang, S., Rott, P. and Gabriel, D. W. (2013). Xanthomonas albilineans OmpA1 appears to be functionally modular and both the OMC and C-like domains are necessary for leaf scald disease of sugarcane. Mol Plant Microbe Interact 26(10): 1200-1210. Hirano, S. S. and Upper, C. D. (2000). Bacteria in the leaf ecosystem with emphasis on Pseudomonas syringae-a pathogen, ice nucleus, and epiphyte. Microbiol Mol Biol Rev 64(3): 624-653. Kumar, N. and Reddy, M. P. (2011). 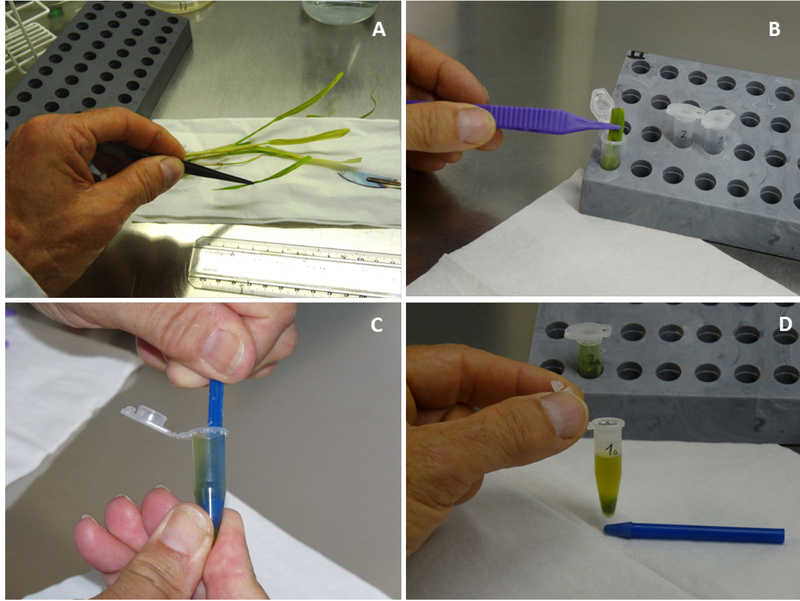 In vitro plant propagation: A review. J Forest Sci 27(2): 61-72. Mensi, I., Daugrois, J. H., Pieretti, I., Gargani, D., Fleites, L. A., Noell, J., Bonnot, F., Gabriel, D. W. and Rott, P. (2016). Surface polysaccharides and quorum sensing are involved in the attachment and survival of Xanthomonas albilineans on sugarcane leaves. Mol Plant Pathol 17(2): 236-246. Rott, P., Fleites, L., Marlow, G., Royer, M. and Gabriel, D. W. (2011). Identification of new candidate pathogenicity factors in the xylem-invading pathogen Xanthomonas albilineans by transposon mutagenesis. Mol Plant Microbe Interact 24(5): 594-605. Yadav, R. K. P., Kakamanoli, K. and Vokou, D. (2010). Estimating bacterial population on the phyllosphere by serial dilution plating and leaf imprint methods. Ecoprint 17: 47-52. How to cite: Mensi, I., Daugrois, J. and Rott, P. (2017). Bioassay of Xanthomonas albilineans Attachment on Sugarcane Leaves. Bio-protocol 7(2): e2111. DOI: 10.21769/BioProtoc.2111.